A new photo claiming to prove that Tupac Shakur is still alive has emerged. In September 1996, the American rapper was shot in a drive-by shooting and died six days later - but many conspiracy theorists are convinced it was a cover up and he was smuggled out of the country. 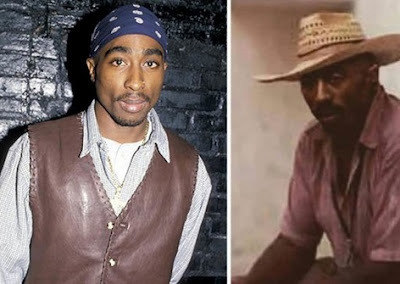 Now a previously unseen grainy image has come to light that, according to YouTube channel Wired Up TV, shows Tupac as he would be now, aged 48. The mystery man in the photo is seated by the side of a road wearing a pink shirt and straw hat, which almost bears an uncanny resemblance to the rapper - with the same high cheekbones and goatee beard. The YouTube channel has posted a lot of videos on their page with the subject 'TUPAC ALIVE', claiming to have evidence of sightings of the iconic rapper as well as reasons he was taken to Mexico. In the clip, the unknown narrator rambles on for several minutes before speaking about the alleged photo of Tupac. He confidently states that there are tattoos on the middle-aged man's arms, which match those of the rapper, who was also known as 2Pac. "Look closely at Tupac’s arms – you can see the outline of tattoos on his left arm," they insist of the extremely blurry image. "The reason you can’t see the tattoos clearly is because he’s covering them up when he goes outside,” he explains. "He’s not trying to be recognised, he’s not trying to be known. "One thing people recognise about Tupac is his tattoos – his bandanna and his tattoos." More than 19,000 people have seen the footage of the picture, but not everyone is convinced of its authenticity. “It may have been from a movie,” one person suggested. Another agreed that it wasn't real: “That looks photoshopped."